This is the new tiny character of Lavi, take it with you wherever you want <3 the ceramic piece is carefully hand shaped and painted, it has lovely sparkles on the top and a cute pink bow as you can see in the picture. 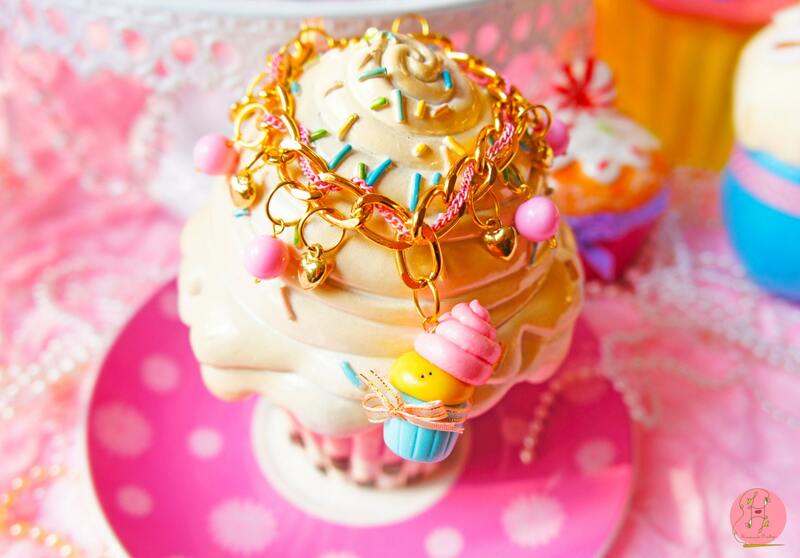 * Ill be posting more cupcake bracelets (in different colors), my character would be the same but not identical, first because the figures are hand shaped and they would never be the same, and second reason is that i buy small quantities of stuff like chains or pearls. Youll never find two identical bracelets in my boutique ¯\_(シ)_/¯. *This beautiful sweet cupcake bracelet is made with fantasy gold chains, fantasy gold heart puffy charms, tiny pink metallic chain braided with the big gold chains, pink plastic pearls, fantasy gold brooches, the cupcake character is totally hand shaped by me, almost a logo fluo tag, every jewelry piece comes in a beautiful handmade box as you can see in the pictures. this one is one of it and all of them are designed by me.